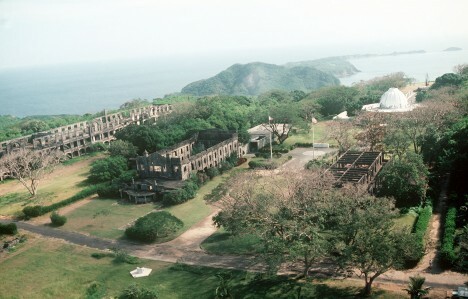 Occupied by the Spanish between 1570 and 1898, Corregidor Island in the Philippines’ Manila Bay was captured by the American military during the Spanish-American War and subsequently turned into a military stronghold for World War II. By May 1942, the island was one of the last Allied strongholds in the Phillippines, under constant siege by the Japanese. 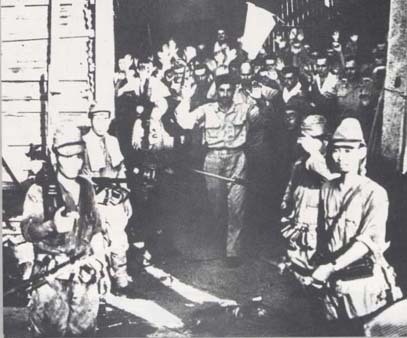 The Americans were forced to surrender when Japanese barges managed to make it onshore, with all 11,500 surviving Allied troops evacuated to a prison stockade in Manila. Japan took over the island, but in 1944, U.S. airborne troops parachuted in to take out the 5,000-strong garrison. 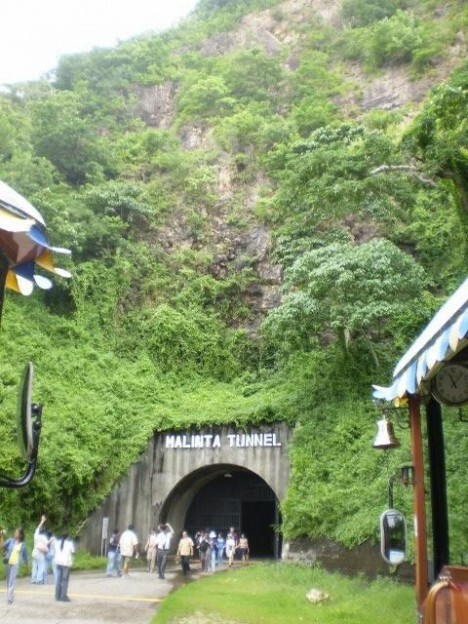 Nearly all of the Japanese soldiers died in the fierce fight that followed, with a large group of them retreating into Malinta Tunnel for safety and eventually igniting a nearby ammunition dump to die on their own terms rather than at the hands of the Americans. It’s unclear how many were killed in the explosion, but the event is believed to be one of the largest mass suicides in history. Once “one of the most feared places on earth,” Devil’s Island was the final judgment site for tens of thousands of criminals in the 19th and 20th centuries. 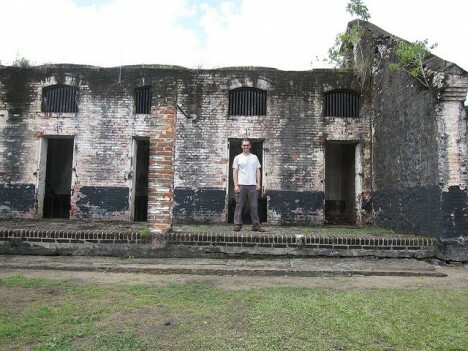 Officially known as the penal colony of Cayenne and located in French Guiana, the notorious prison was used for exile of French political prisoners as well as hardened criminals. Individuals whom Napoleon simply didn’t want around were imprisoned alongside murderers in a total population that peaked at around 80,000. The colony was rife with disease, and if any prisoners managed to escape, they didn’t get far in the shark-infested waters. The vast majority of them languished their for the rest of their lives, suffering extremely harsh conditions. The prison was shut down after a century in 1953 and the buildings have slowly crumbled into the jungle, the ruins accessible to the thousands of tourists who access the island each year. 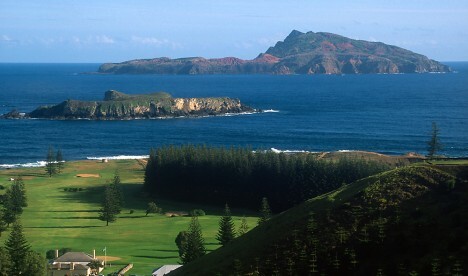 Once Britain’s most brutal convict colony, Norfolk Island was reportedly such a miserable place to be that criminals begged to be executed rather than languish there. Located between Australia, New Zealand and New Caledonia, the remote self-governing Australian territory is 877 miles from the mainland, making it an ideal place to deposit violent convicts. Perhaps the jailers felt that these inhabitants deserved the vicious treatment that was doled out there – reportedly including torture, lashings, murders and rapes – from the time it was established in 1788 until it was closed in 1855. 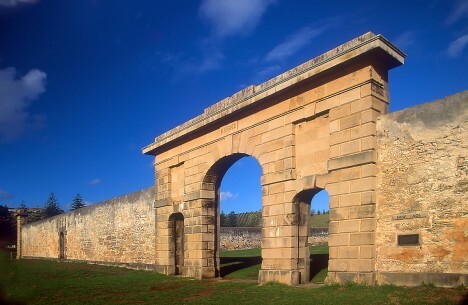 But according to a recent study on the 6,458 Norfolk Island convicts, more than half were detained without ever receiving a colonial conviction, and most of the convicts had committed non-violent property sentences. Most of them died there, but a final group was removed to Tasmania before the island was repopulated by the descendants of Tahitians and the HMS Bounty mutineers, who had famously settled the Pitcairn Islands. 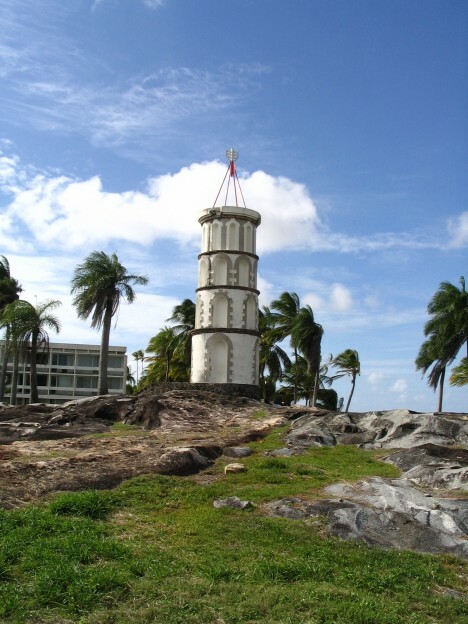 Today, the island is home to about 2,300 permanent residents. 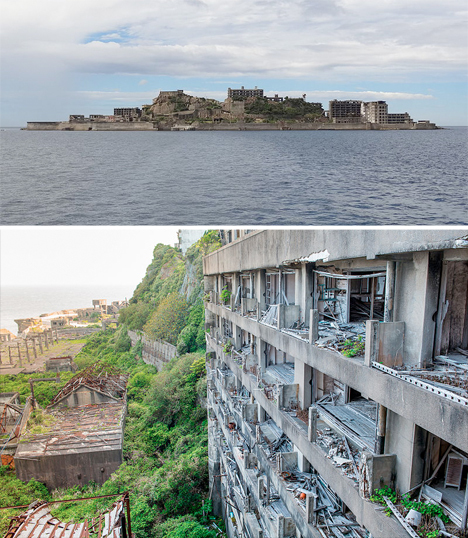 Officially named Hashima Island, this uninhabited man-made island located about 9 miles from Nagasaki in Japan is colloquially known as Gunkanjima, or Battleship Island. 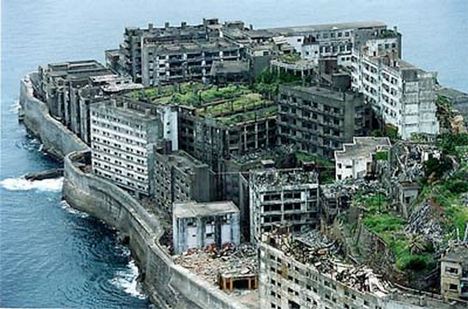 Populated from 1887 to 1974 as a coal mining facility, the island resembles a military warship from afar. Starting as a small reef, the island was developed and expanded over the years, the harsh concrete structures over-engineered to stand up to typhoons. 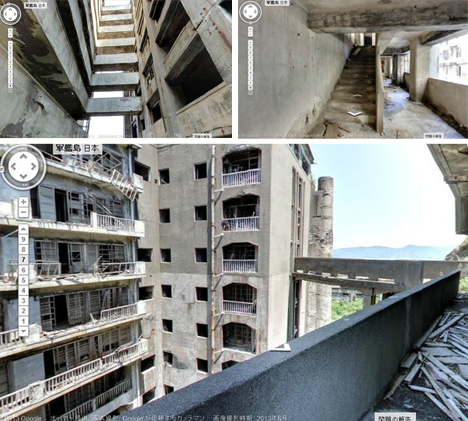 At one time, the tiny island was home to 5,259 people working in the mines, but once Japan switched from coal to petroleum, work stopped and Gunkanjima was abandoned. 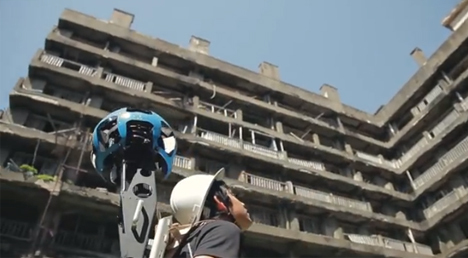 Access was forbidden for years, but tourists are now allowed to explore certain areas of it, and Google sent one of its employees there to capture images of the rubble in 2014.